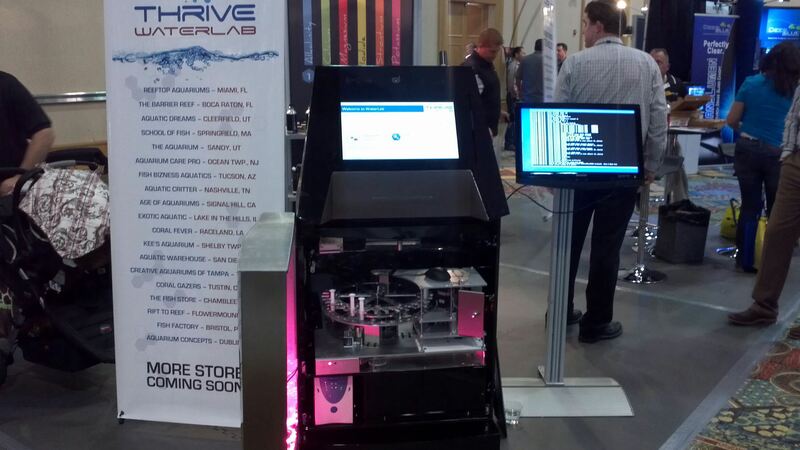 Thrive Aquatics today unveiled its Automated Water Testing Lab at the MACNA 2013 show in Ft Lauderdale. Karlsson Robotics was responsible for all the automation and control systems and assisted in mechanical design elements of the water lab. Operation is simple, a customer walks up to the water lab and inserts a sample from their tank or pond. If a specific condition exists in the tank the interface will select a battery of tests to perform else a customer can select individual tests. Water is dispensed from the syringe into cuvettes and then analyzed for different components i.e. Nitrates, Ammonia, Ph etc. Depending on the tank size and water type a prescription is generated for the customer. This prescription contains chemicals or additives that can return the tank back to an ideal condition. For more information on the Kiosk contact Thrive Aquatics. For design assistance for your own projects contact us. What types of sensors are available to monitor pH, CO2 and O2 levels in water? We don’t really do real-time water monitoring.